Guatemalan President Jimmy Morales arrived in Israel on Tuesday to take part in the official reopening of the Central American country’s embassy in Jerusalem’s Malha Technology Park on Wednesday. Guatemala had an embassy in Jerusalem until 1980. But it pulled it out – along with several other countries – when the Knesset passed the Jerusalem Law in 1980 that declared “united” Jerusalem as the capital of Israel. Mattanya Cohen, Israel’s ambassador to Guatemala and Honduras, said in a Kan Bet interview that Guatemala has a tradition of friendship for Israel that goes back to efforts by Jorge Garcia Granados, the country’s ambassador to the UN at the time, to push for acceptance of the Partition Plan in 1947. Cohen noted that just as Guatemala was the second country in 1948, after the United States, to recognize Israel, it is now the second country, after the US, to move its embassy to Jerusalem. Cohen attributed Guatemala’s support for Israel in large part to the strong Evangelical presence in the country, saying more than half of the country’s 16.5 million people are Evangelicals, including Morales and Foreign Minister Sandra Jovel. Jovel, on her first trip to Israel, has been here since Friday and took part in the ceremony on Monday marking the transfer of the US Embassy to Jerusalem. According to the paper, an estimated 3,000 Guatemalans have received professional training in Israel. In addition to Jovel, Morales is being accompanied by his defense and economy ministers, as well as his secretary of strategic intelligence. He is scheduled to return home on Thursday. 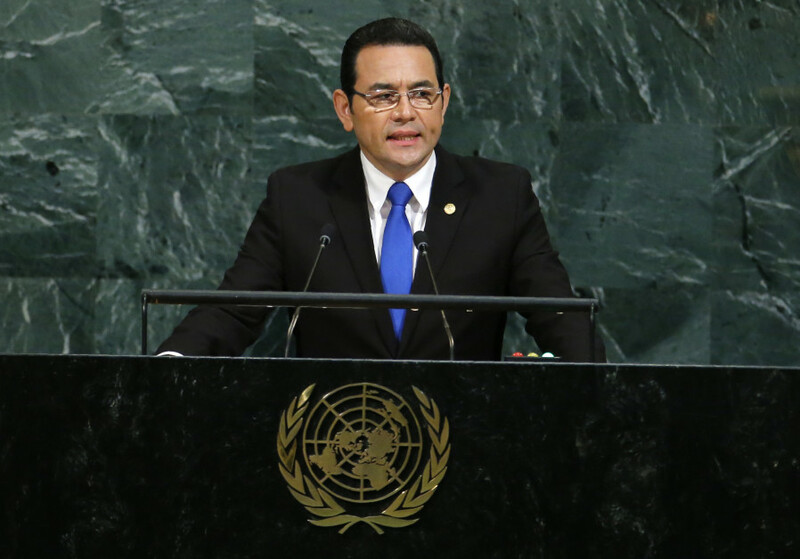 Morales told The Jerusalem Post at the time that Guatemala had received “the pushback that was expected” from the decision. But he expressed his belief that more countries would follow his lead. Neighboring Honduras is expected to announce a similar move in the near future. Morales told AIPAC that the US decision to move its embassy “opened space” for other nations to do what they have known to be right for some time, but for one reason or another simply lacked the courage or conviction to do. “I would like to thank President [Donald] Trump for leading the way. His courageous decision has encouraged us to do what is right,” he said at the time. “It is important to be the first. It is more important to do what is right.